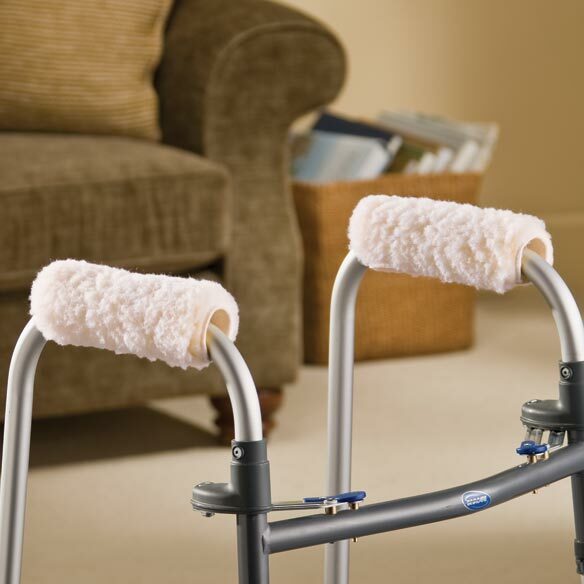 Add comfort and functionality to your walker with a pair of fleece walker handle pads from Easy Comforts. These fleece walker hand grips eliminate the discomfort of the cold, hard bars of your walker, adding considerable cushioning and softness to plastic and metal walker hand bars. Featuring high-quality materials and excellent construction, these walker hand grips are designed to provide lasting comfort and durability. It’s easy to keep these fleece walker grips in like-new condition; simply place them in your washing machine and dryer to clean and fluff. Makes a wonderful gift for your friend or loved one, and are an excellent way to make both temporary and permanent walker use easier and more comfortable. Set includes two walker hand grips constructed from self-fastening polyester, easily customizable to perfectly fit your walker handles. Each walker handle pad measures 3 ½” x 9 ½”. They make the grip area comfortable. Works great with a walker. Doesn't fit most cane hand grips. Was getting calouses on my hands from the hard plastic handles on my rollator walker, so these are great and make the handles much softer. May have to do some cutting to make them fit better, but, gee, that's no biggie! Would recommend them to anyone who has any type of walker at all! Or if you have a loved one who uses a walker, make this a priority gift! Along with a bag and a cup holder...great necessities! I have to put a lot of weight on my walker and this makes it much more comfortable for my hands. I don't want to do without them again. This is the first time I have seen the ones for a walker advertised. Ususally it is hand grips for wheel chairs which I also use. Thanks again. User-friendly for my arthritic hands. I'm enjoying them daily. I got these grips for my Mom who is so afraid of falling using her walker that she grips the handles tightly. These grips are soft and very secure and have been a great help to make her more comfortable. NICE AND SOFT BUT WEAR OUT VERY FAST. I use a walker all day everyday. Your hands get pressed so hard that sores can occur. With these grips your hand is eased by the softness of the product. the hand grips are very hard this item should soften them. to replace the grips that are on my husband's walker. He needs something more cushioned. My hands are sore and weak from RA and I hope these will help. My walker is old and these wraps solved the problem. For minimizing pressure on hands when using walker. needed something soft to pad my hands when leaning on my walker. They work fairly well, but the fleece compacts pretty quickly. Beats the plastic grips on the walker though! These handles are wide and cover the whole handle which makes them more comfortable. Walker has hard handles that hurt my hands. Getting calluses on heel of hands due to much walking. My aunt uses a walker and this makes getting around so much more comfortable for her hands! I have a painful spot in my palm and I thought this would lessen the pain when I held onto the walker I will need when I have knee replacement surgery. Bought these before for my mom's walkers & she loves them. They really protect her hands from bruising and callouses. Constantly being asked where I bought them. My father uses a walker daily and I want his hands to be warm and comfortable. To help my husband use his walker with less pain to his hands. Softens the pressure for my hands using the walker. My Grandmother's Walker hurts her hands, so i thought these would help provide cushioning. For my walker but they were too thick. Had a nice set but lost one and can't find them anywhere now, went on all the sights. Guess they don's make them anymore. BEST ANSWER: Thank you for your question. Unfortunately no we do not carry this item in black. We hope this information will be of help to you. how to replace rubber handles on walker ? BEST ANSWER: Thank you for your question. We do not sell the rubber handles, you may want to contact the manufacturer. We hope this information will be of help to you.